The DCI Southwestern Championship on July 18 brought together intricate show designs, amazing talent and corps members' unbridled spirit. Fans were treated to a show featuring 21 World Class corps making a stand on the field at the legendary Alamodome in San Antonio. Facing off for the first time in the same arena, the order of appearance was determined by averaging the scores from prior events that were part of the three-day DCI Southwestern Series presented by Jupiter Band Instruments. The series included simultaneous events hosted in Houston and Dallas over the course of two nights. The Blue Devils dominated World Class competition at the Alamodome, taking home the award for the evening's champion, the overall series title, as well as every adjudication sub-caption. Many of the other corps also had reason to celebrate as they tested their skills against all others to see how they measured up to the rest of the competition. The series' events pushed corps like Blue Stars and Troopers up in the rankings as each corps made record-breaking advancements. Drum corps fans: keep checking DCI.org to follow along as competition heats up and corps gear up for the final stretch in their race to the World Championships this August in Indianapolis. 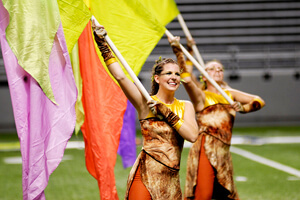 View photos from the DCI Southwestern Championship. Photos by Craig Olear.